Bizible came to New Breed looking for a partner to help it develop their new website on the HubSpot CMS. In the company's own words, their existing website was the "Frankenstein of B2B SaaS websites," and it wanted to bring their new site onto the CMS to have both their marketing automation and website live on the HubSpot platform since the site is the hub of their lead generation efforts. Though Bizible was unhappy with the design of its old site, it didn't realize that a newly designed site on the CMS would triple conversion rates! Bizible worked closely with Studio Science on the website design concepts and artwork. Their partnership resulted in what we consider to be the epitome of a modern SaaS site. It has an incredibly clean design, minimal but impactful copy, and graphical elements that help convey the value of the platform. We were really excited to take these concepts to life on the HubSpot CMS. The lead generation elements of the site are also clearly highlighted. For example, the resources section on the homepage, and a dedicated resource-center allow Bizible to highlight content offers in a way they weren't able to before. By placing these offers in easily accessible areas of the site, visitors have greater opportunities for conversion. Next, an inline form was included on all the pages of the site. Though this isn't native functionality in HubSpot, our team was able to style the embedded form and paired with the progressive profiling functionality of HubSpot forms, it makes it incredibly easy for a visitor to share their information with Bizible. Additionally, the inclusion of this persistent demo form reduces the hassle visitors have to go through to get in contact with someone at the company. To increase UX and free trial conversions, a locked navigation bar was put into place. 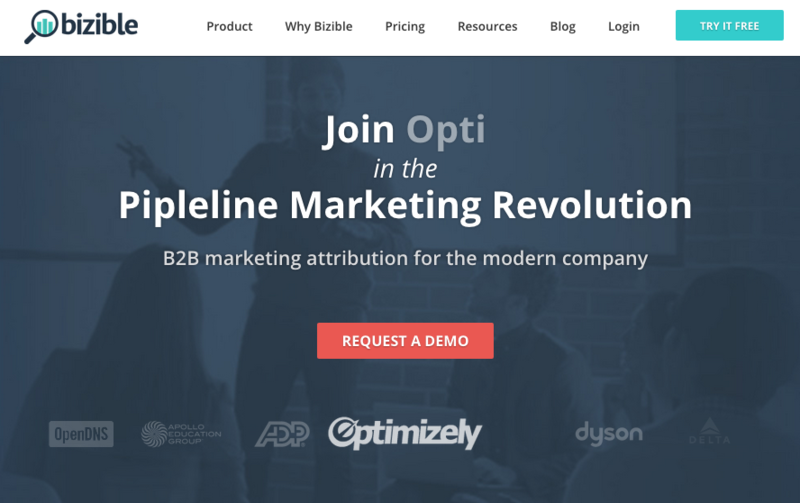 For the first time, Bizible decided have a long-scrolling site design, and when you scroll through the pages, the free-trial CTA stays present. Before, if you scrolled past a certain point, you'd lose that opportunity for conversion. Lastly, to conquer the top of the funnel, the design included a slide-in CTA on the blog. That way, when a reader scrolls down a certain amount, a relevant content offer will appear in the bottom, right-hand corner. Additionally, the team over at Bizible wrote an awesome blog post on the redesign, describing each of these KPIs in more depth. To read more, here's the post. Previously Bizible had many links and CTAs across the homepage. In the site redesign the organization narrowed those links/CTAs down to just seven, mainly focused on getting people into a free demo. 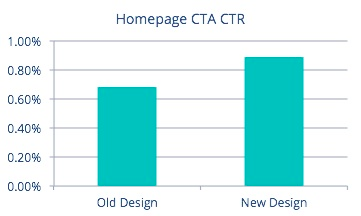 Overall, the CTR on homepage CTAs increased by 29 percent. 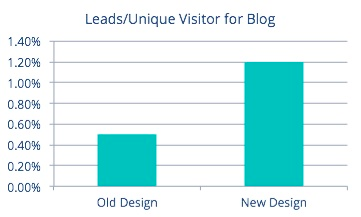 The performance of the blog has also drastically increased. In the new design, a slide-in module was included with a HubSpot CTA. The slider has a CTR of 1.54 percent (to the landing page), and a remarkably high conversion rate (48 percent). Most importantly, the implementation of the inline demo form has resulted in an increase of inbound demo requests by 40 percent. The collaboration between Bizible, Studio Science and New Breed has made this redesign a hugely successful and impactful project for Bizible. It has been able to grow its businesses faster with the help of this new website, delivering more prospects at the top, middle and bottom of the funnel.